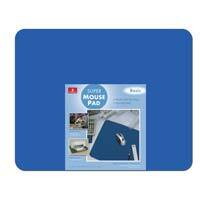 The Super Mouse Pad is the largest mouse pad currently being manufactured, and is perfect for use on mechanical, optical, or laser mice. Due to its large surface, the Super Mouse Pad is ideal for gaming, drafting, and more. It can also be placed underneath loud printers to prevent vibrations. Help bring more comfort to your lifestyle, by purchasing a Super Mouse Pad today! 17.5" x 13.5" x 0.19"